Organizing your home is an extremely difficult task. There is more to home organization that just chucking the rubbish into the trash can. 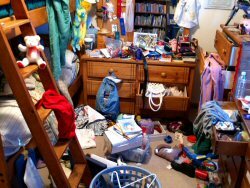 The moment you step into your child’s room, you will feel as if you are visiting a battle ground right after it has reached its end. Clothes will be lying about here and there and the shoes and toys will be helplessly looking at you from the floor. Be it the kids’ room or your own, you will often find that no matter how much you try to keep things in their proper place, at the end of the day, it seems as if catastrophe has struck! You will never be able to find something important when you need it the most as it is simply lost somewhere under the huge pile of clothes and sheets that is almost as high as a mountain. So how is it that you are going to organize your home? Well, we at Best in Bedding have come up with a list of innovative articles that will provide you valuable tips on how to achieve this aim. Whether you want to get rid of unnecessary clutter or store your winter clothing in a proper manner, these articles will assist you through it all. Other than the normal organizing, there are some cleaning techniques that have also been discussed here and can be applied to the floors as well as the window blinds. Do your guests stay too long..? How to boot them out nicely! What Is The Best And Easiest Way To Clean Window Blinds?